It’s that time of year when Christmas feels like a very long time ago and there are a couple of months to go before spring makes an appearance and everything feels a bit cold and bleak. There may be flurries of snow here and there, and rain, fog, frost and the chilliest gusts of wind make regular appearances across the country. The hot summer of last year certainly feels like a distant memory. It’s easy for us to stay warm when we’re out and about, we have hats, gloves and scarves, as well as thick socks, shoes and a decent winter coat, but for our furry friends, things aren't always so cosy. Although most cats have a snuggly furry coat to protect them from the cold, long periods of time outside in the elements aren't ideal, even for the fluffiest felines. First and foremost, ensure your cat flap doesn't get frozen. You want to ensure that your cat can get outside if they need to, but you also don't want them to get stuck out in the cold, so do keep an eye on it on particularly frosty days. If you do experience any heavy snow, make sure you clear a space in front of the cat flap so that they don’t get snowed in. If you regularly have strays visiting your garden, ensure there is a place for them to shelter - a cat flap into a shed would be a treat, or a sheltered corner of the garden away from the wind. Keep an eye on any water that you leave out for them too as it may freeze. Many cats are attracted to warm car engines and will often hop up inside the car to get warm. It’s always worth checking before you drive off to avoid any accidents. Whilst we're on the topic of cars, it's worth noting that de-icer and screen wash contain ethylene glycol and some cats are attracted to the smell of this. If ingested it can be deadly, so if you have cats or there are strays in your neighbourhood, be mindful of this and perhaps use the more traditional method of scraper and elbow grease - it will soon warm you up! If your cat has arthritis, much like humans, the cold can make everything feel more painful. Make sure that you make things as comfortable as possible for them and ensure that they can access the outside or their litter tray with ease. If your cat likes to hang out outside in the evenings whilst it's dark, think about investing in a high vis collar, so that they are more visible to motorists. 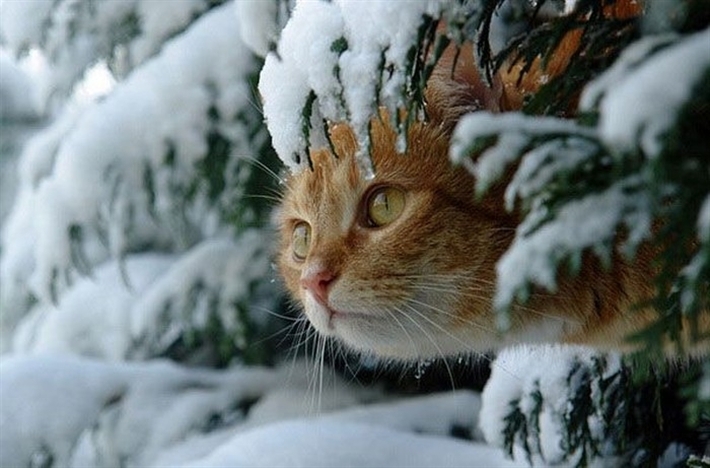 If you follow the steps above you will make the winter months much easier for your cat. We think winter should be about warm snuggles, soft blankets and lots of yummy treats!